Cross an Italian dessert with today's hottest treat for Tiramisu Cookie Balls. What do you get? Tiramisu Cookie Balls. And Tiramisu Cookie Balls are as scrumptious as you'd imagine. Mix cream cheese, wafer crumbs and 1 Tbsp. coffee until blended. Shape into 36 (1-inch) balls. Freeze 10 min. Mix white chocolate and remaining coffee. 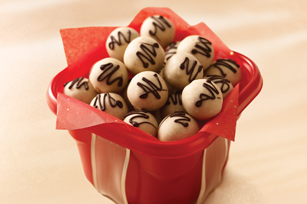 Dip cookie balls in white chocolate mixture; place in single layer in shallow waxed paper-lined pan. Drizzle with semi-sweet chocolate.